Cleo had a rough road before she came to BCR...and it was still a little rocky after she joined our crew. Miss Cleo was dumped in the country, either with her babies, or VERY pregnant. She had her five kittens under an abandoned trailer. Nightly, she battled against raccoons that sought to steal her territory, and harm her family. When she and her kittens came to us, she had a profusion of open wounds. Because they were given to her by raccoons, she spent the first six months of her stay with BCR in a large dog crate. For the next six months or so after that, we dealt with the abscesses surfacing and draining...this mama had some war wounds! After an entire year of being treated as "medical cat" Cleo was finally free to be adopted! But occasionally, she'd have bits of skin show through her soft and pettable coat. After ~many~ visits with the vet, we surmised that when Cleo is under stress, her skin reacts. It doesn't seem to bother her at all, and it clears up rapidly. Her episodes have been far, and few between, and we know that she is ready for her forever family! Cleo loves other animals! She gets along wonderfully with other cats, (although she can be a little bit of a food bully) and rubs all over the large dog she's fostered with. She even got along with the chickens when they had to come inside! Miss Cleo likes children of all ages, especially those who know that she'd rather have her ears and bum scratched over being picked up and carried around. She doesn't like too much chaos, but she adapts well to new situations. 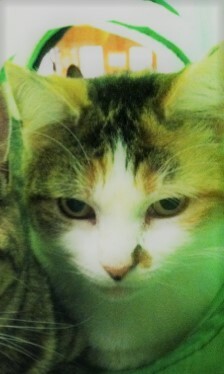 If you are looking for a sweet and somewhat stocky gal to keep you company, Cleo would love to be your forever friend!